If you were taking an afternoon walk by the light rail construction this week, chances are you passed a blond man. He was wearing a salmon jacket and wide legged pants, both of which are covered in paint. This man is Sam Trout, and as of Wednesday, he was parked in front of the Sound Transit Capitol Hill Art Wall for six days. That job was given to Trout through an arts grant from Sound Transit, which enlisted him as the newest artist to lend his talents to the Capitol Hill Art Wall project. Trout’s piece, “Landscape of the Vanities,” is a complex, flowing mural, with a contrasting mix of hard lines and organic shapes. The piece does look like Seattle—a mesh of clean, metropolitan lines that harken back to the stylish futurism of the ’62 World’s Fair, mixed with curvy, pulsing figures wouldn’t look out of place wiggling around on a slide under a microscope. It’s a portrait of a surreal, biologically thriving city. 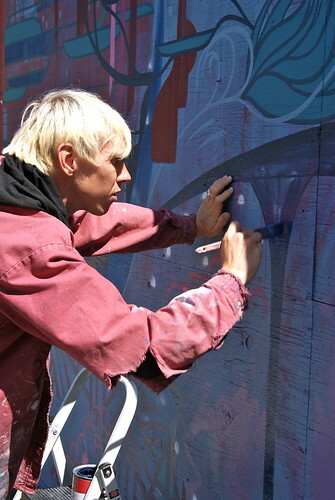 Trout has been in Seattle since 2000, starting out as a painter with frequent gallery shows in the city. Trout shifted his focus to selling his own shirt designs, but later realized he wanted to move away from the more sales oriented work. The mural is one of Trout’s larger re-entries back into the world of painting, after having started a number of commissions for friends and clients. Trout hopes to finish his piece for the Art Wall by the end of week. 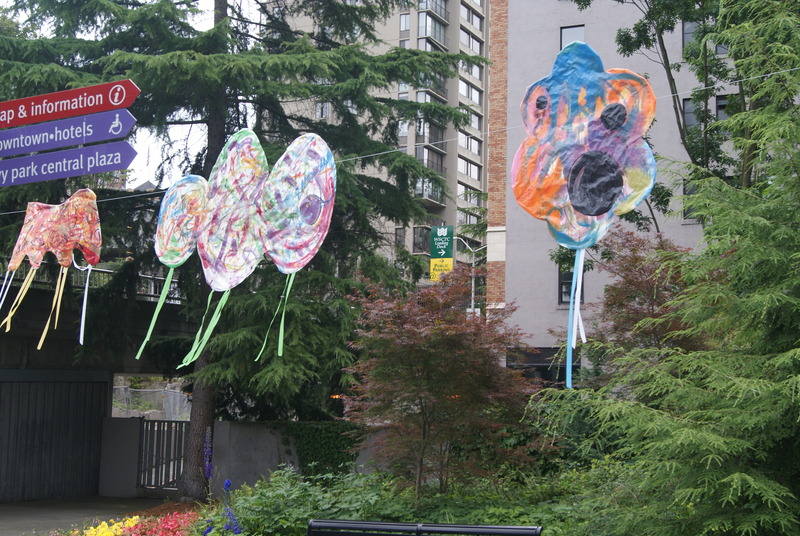 In other art news, Freeway Park was recently overtaken by 230 kites. 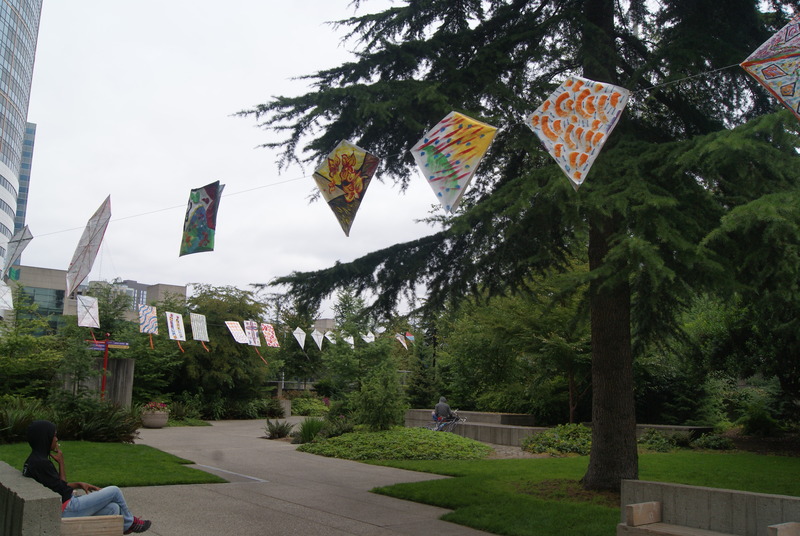 Bryan Ohno, art director of Urban Art Concept created “The Flying Freeway” by getting professional artists, kids, and adults to paint kites to be strung up along the park. Nice to see some art reporting here. I saw those kites yesterday and wondered about them. Sam is a friend of mine and I am SO HAPPY he is getting recognized in Seattle. His art is amazing. It’s really great to see more local artists like Sam getting a chance to do their thing. And, keeping the construction walls fresh and interesting makes a huge difference for our neighborhood. Thanks to Sound Transit for promoting a great arts program! Great job Sam, your work is amazing.